The Coronation of her Majesty Queen Elizabeth II took place on 2 June 1953 at Westminster Abbey, London during which she was crowned Queen of the United Kingdom, Canada, Australia, New Zealand and Her Other Realms and Territories & Head of the Commonwealth. Queen Elizabeth II Was born 21st April 1926 and is the constitutional monarch of 16 sovereign states known as the Commonwealth realms, and head of the 54-member Commonwealth of Nations. In her specific role as the monarch of the UnitedKingdom, one of her 16 realms, she is also Supreme Governor of the Church of England. Elizabeth was born in London, and educated privately at home. Her father acceded to the throne as George VI in 1936 on the abdication of his brother Edward VIII and She began to undertake public duties during the Second World War, and also served in the Auxiliary Territorial Service. On the death of her father in 1952, she became Head of the Commonwealth and queen regnant of seven independent Commonwealth countries: the United Kingdom, Canada, Australia, New Zealand, South Africa, Pakistan, and Ceylon (Sri Lanka). Her coronation service in 1953 was the first to be televised. Between 1956 and 1992, many territories gained independence or became republics. Today, Elizabeth is Queen of Jamaica,Barbados, the Bahamas, Grenada, Papua New Guinea, the Solomon Islands, Tuvalu, Saint Lucia, Saint Vincent and the Grenadines, Belize, Antigua and Barbuda, and Saint Kitts and Nevis. In 1947 she married Prince Philip, Duke of Edinburgh, with whom she has four children: Charles, Anne, Andrew, and Edward. and Her reign of 60 years is the second-longest for a British monarch; only Queen Victoria has reigned longer. 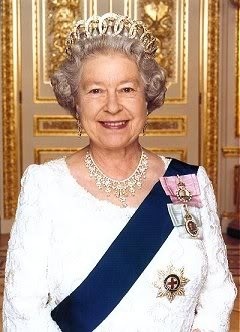 Her Silver and Golden Jubilees were celebrated in 1977 and 2002; her Diamond Jubilee was celebrated 2012. During 1952 her Father King George VI’s health unfortunately declined, and Elizabeth frequently stood in for him at public events. In October of that year, she toured Canada, and visited President Truman in Washington, D.C. And on the trip, her private secretary, Martin Charteris, carried a draft accession declaration for use if the King died while she was on tour. In early 1952, Elizabeth and Philip set out for a tour of Australia and New Zealand by way of Kenya. On 6 February 1952, they had just returned to their Kenyan home, Sagana Lodge, after a night spent at Treetops Hotel, when word arrived of the death of Elizabeth’s father. Philip broke the news to the new queen. Martin Charteris asked her to choose a regal name; she chose to remain Elizabeth, “of course”. She was proclaimed queen throughout her realms, and the royal party hastily returned to the United Kingdom. She and the Duke of Edinburgh moved into Buckingham Palace.With Elizabeth’s accession it seemed likely that the royal house would bear her husband’s name. Lord Mountbatten thought it would be the House of Mountbatten, as Elizabeth would typically have taken Philip’s last name on marriage; however Elizabeth’s grandmother Queen Mary and British Prime Minister Winston Churchill favoured the retention of the House of Windsor, and so Windsor it remained. The death of Queen Mary also occurred ten weeks before, Before she died, Mary had asked that the coronation not be delayed. The ceremony in Westminster Abbey, except the anointing and communion, was televised and was the first major international event to be televised. Elizabeth’s pregnancies with Princes Andrew and Edward in 1959 and 1963, respectively, mark the only times she has not performed the State Opening of the British parliament during her reign. In addition to performing traditional ceremonies, she also instituted new practices such as the Royal Walkabout. Her first royal walkabout, meeting ordinary members of the public, took place during a tour of Australia and New Zealand in 1970. In 1977, Elizabeth marked the Silver Jubilee of her accession. Many street parties and other events were held to mark the occasion (I used to have a commemorative mug) Many of which coincided with the Queens Associated National and Commonwealth tours and These celebrations re-affirmed the Queen’s ongoing popularity She again undertook an extensive tour of her realms, which began in Jamaica in February, As in 1977, there were many street parties and commemorative events, and monuments bult to honour the occasion. A million people attended each day of the three-day main Jubilee celebration in London, and the enthusiasm shown by the public for Elizabeth again re-affirmed her ongoing popularity.